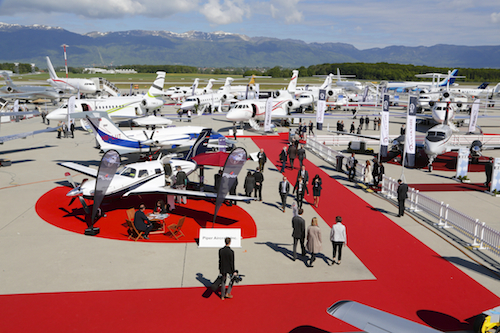 First time visitors to the European Business Aviation Convention and Exhibition, be warned – ensure you wear comfortable shoes, remember to eat, drink and go the loo during the day (could be just me on that one) and be ready to enjoy the magnificent array of aircraft on display. More than 50 aircraft of ’em at last count. These guys are all out on the static park, which is conveniently situated outside the formerly full Hall 7 in Geneva’s Palexpo convention centre. It is the second largest event on the international business aviation show circuit, and an important marker as to what’s going down. This year I’ll mostly be looking out for what the interiors guys have on show – both concepts from the big houses: AMAC, Associated Air Center, Jet Aviation, Lufthansa Technik, Gore Designs and the like – and some of the whizzy technical gear from the inflight entertainment and connectivity providers. Otherwise, take the time to enjoy the delights of Geneva. Expect to pay five times as much as you usually would for something as simple as a hamburger. But then revel in the fact all the hotels give out free public transport passes, and if you’re at the show as a serious visitor, chances are you’ll get fed and watered on site anyway! Great heads up on the big expo. I know we should really wait for post-show reports, but any chance of a sneak preview on any on board entertainment system developments likely to land at Geneva, for us tech junkies? Hello tech junkie. Give me a shout when you have a minute!